1 Is it a wolf, husky,fox etc.? 2 How many % of wolf blood do they have? 3 Did Czechoslovakian wolfdog eat Little Red Riding Hood? 4 Is Czechoslovakian wolfdog aggressive? 5 Is CSW a good dog for newbie? 6 Is CSW good for epileptic? 7 Is CSW OK with children? 8 Is it better male or female? 9 Do CSW require a garden, is he a guard dog or is he OK with living in flat? 10 Can be CSW trained? 11 When to start going out to training grounds? 12 How much of physical activites does CSW need? 14 Csw and other animals? 16 CSW and small dog? 17 Do CSW have tendency to run out of property? 18 How to care about the fur? 19 How often needs CSW to take a bath? 20 What leash and collar should be used? 21 Is there a CSW-proof toy? 22 How much does the puppy cost? 23 Is breeding a profitable operation? 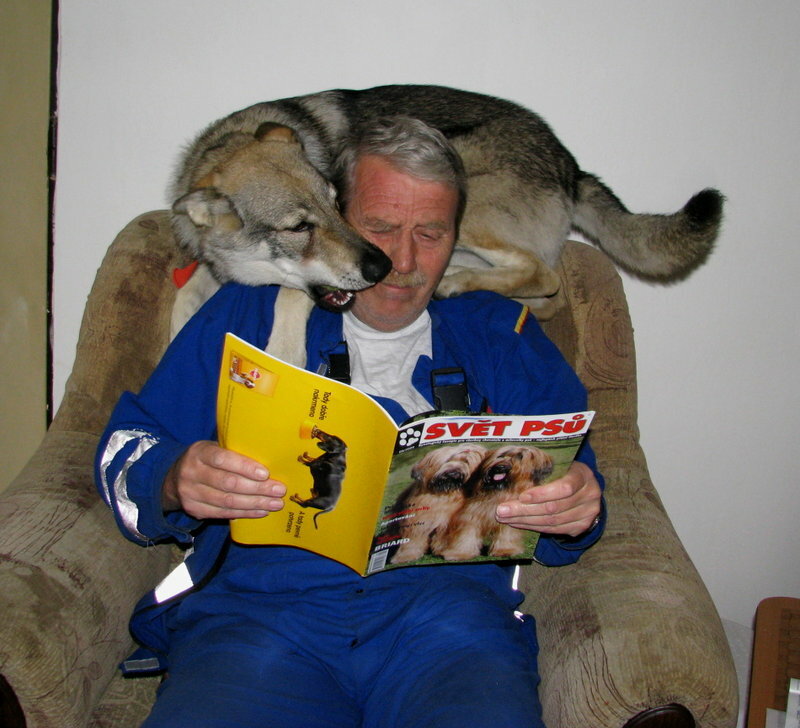 Czechoslovakian wolfdogs often raise astonishment and many questions. That is why I would like to create an article, in which you can find answers to the most frequent questions. 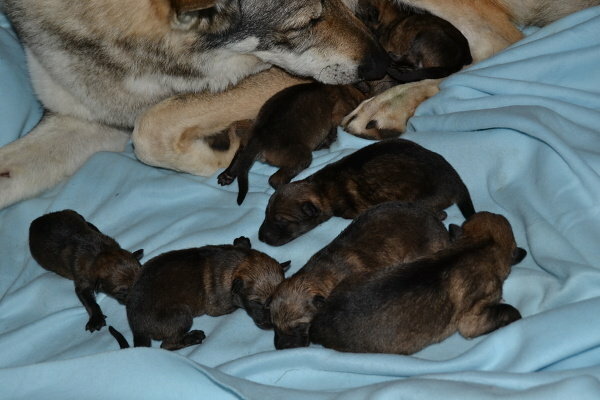 We will try to put together as many of them as we can and I hope they will complement our other information articles and help people to find out more about Czechoslovakian wolfdog. Is it a wolf, husky,fox etc.? History:  In 1955, a biological experiment took place in the former CSSR - a crossbreeding of a German shepard and Carpathian wolf. The experiment confirmed that it is possibleto rear offspring from a male dog/female wolf as well as from a male wolf/female dog. Most crossbreeds were genetically preconditioned for further breeding. In 1965, when the experiments were finished, a project for creation of a new dog breed, which would connect wolf´s useful qualities with suitable traits of a dog. 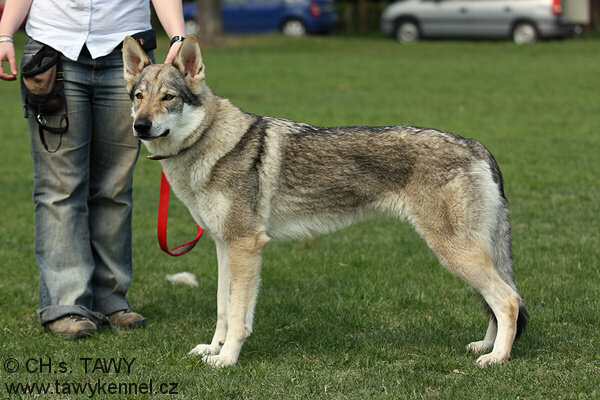 Czechoslovakian wolfdog was accepted as a national breed by the then CSR Federal Committee of Breeders Union in 1982. How many % of wolf blood do they have? It is necessary to note here that there is a difference between % of wolf blood from mathematical or genetical point of view. Each Czechoslovakian wolfdog has between 27-30% of wolf blood from a purely mathematical point of view. It is an interesting fact that actually does not say much. Czechoslovakian wolfdog does not have anything in common with wolf genetically any more. So Czechoslovakian wolfdog is a dog, maybe closer to wolf than other breeds but they are no wild uncontrollable beasts. The closest I know of is a wolf in the 7th generation ( in our pack it is for example Ebi) but mostly it is already the 8th or 9th generation. sometimes they also behave as wolves, at least for laymen. Did Czechoslovakian wolfdog eat Little Red Riding Hood? That is a very frequent question - if those wolves of ours ate Little Red Riding Hood. Well, I must disappoint everyone, they didn´t. It is only a fairy tale to scare small children. Aggression to dogs:   Female as well as male dogs of this breed are concerned with dominance within their own breed. Is CSW a good dog for newbie? Important thing to remember, dog mirrors his owner so aggressor will raise aggressive dog and so on. And there is no other breed to prepare you for living with CSW. They are.. Unique. Owner has to be responsible, consistent and with a gift of understanding for wolfdog shenanigans. them to the breeder and forget CSWs ever existed. you and will do what he wants. That can be corrected by the proper training. It´s a dog breed, not some hellhound. they are mentally unstable, they are only for professionals, he will kill you, red riding hood “ and so on. So: if you are clinging to properties, if you do want a 100% controllable dog or a dog who will consider you a god… nope. CSW is not really for you. give me a word and come to get to know them. But remember. CSW is not just a dog or some trinket. It´s a way of life. Is CSW good for epileptic? Yes, sure. One of „my“ owners is epileptic and there is no problem at all. On the contrary, the dog can sense the incoming fit. Is CSW OK with children? Properly socialised and raised CSW is 100% ok with kids. But it takes a lot of work and it is not some kind of stuffed toy. As every other dog, CSW has to be supervised while being together with a kid and NEVER EVER be left with a kid alone. It is also very important for the CSW to have only positive experience with kids. lot of patience, but the results are worth it. CSWs love „their“ children, they will guard them, protect them, play with them and be an incredible partner for life. Is it better male or female? One of the most frequent question I am getting. There is no clear answer. The biggest difference is their body. Dog can be 15kg heavier and 10 or more cm taller. And that actually makes a difference in case of manipulation. Both genders are going to be dominant against their own. going for the blood. And dividing two fighting females is sometimes very problematic and difficult task. much powerful than females so it counts a lot. mystery and it had took a heavy toll on their owners grey hair count. Do CSW have desire for physical contact? Instead, it is very interested in creating bloody abstract pictures on its owner. Yes, a little CSW puppy will rather run around and bite everything that moves instead of just lie down and act cute. But of course there are individuals who love human contact from their first day. 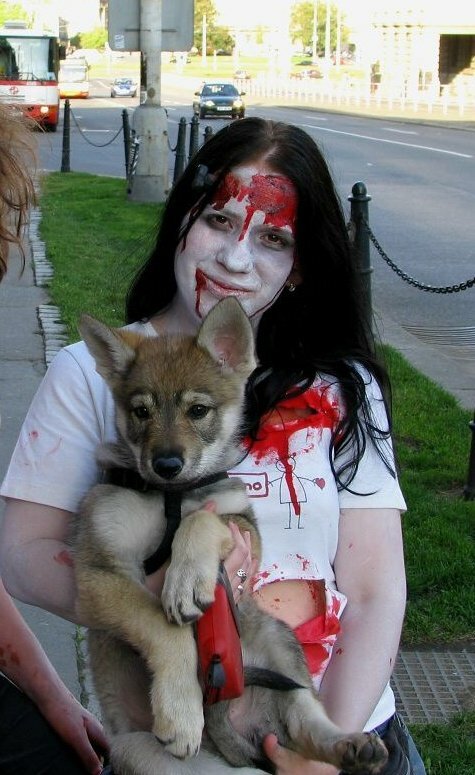 My oldest, Arya, was not really into caressing as a young puppy. And she was giving a pretty strong hint by growling. Sleeping in a bed? No way! But as she grew up, suddenly the bed was a very go and she was very eager for human contact. and caressing, usually when I come back from work or before we go to sleep. So, you never know what to expect but with the growing up the CSW will love human contact more and more. But if you are looking for a living teddy bear, I am afraid the CSW will not pass. Do CSW require a garden, is he a guard dog or is he OK with living in flat? is so dependant on their pack, the can and often will be happier in the flat. Everyone has to find their perfect solution. I have the outside kennel, garden and the dogs live in my house as well. What is important is to be mindful of the problems with separation and resulting destruction of properties. that he is Ok there and he does´nt need our attention. Yes, but he will never be performing with the enthusiasm of GSD or belgian shepherd. treats, intonation and body language. So the road can be pretty bumpy. there are even search and rescue CSWs. Do whatever you like, some tips are here - CSW and possible activities. When to start going out to training grounds? ASAP, really. After third inoculations you will be permitted to enter the training grounds so start immediately afterwards. training is also possible, but be careful and watch for their teeth. it is not good enough, go somewhere else, your dog is worth it for sure. How much of physical activites does CSW need? If you are working during weekdays and you are making trips in the weekends, CSW will also learn to be OK with that. 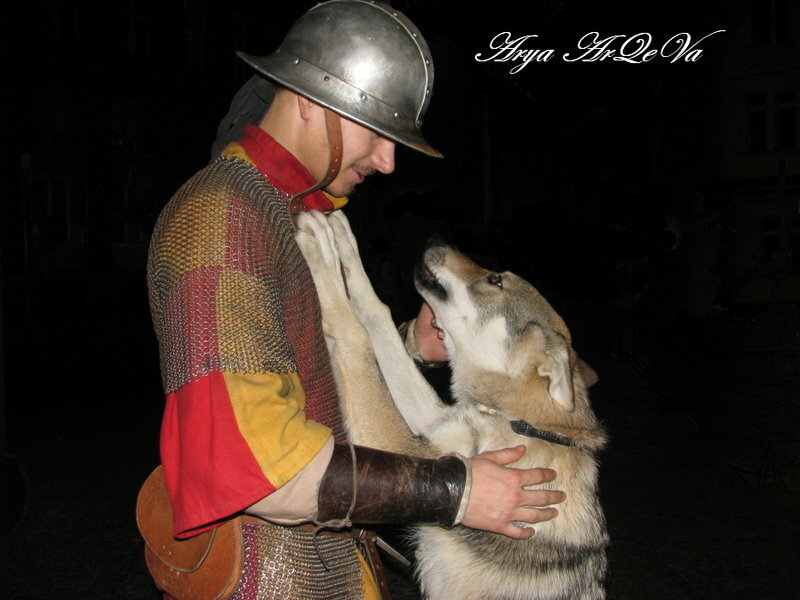 activity - training, trips to interesting places, meeting other dogs and so on. There is a lot of CSWs living peacefully with other animals. Rabbits, rats, snakes or livestock. without hurting them, but be very watchful. In the case of CSW, be watchful on the borderline with being paranoid. Sometimes even over the line. Never leave them alone. chase him to death… after all, whatever runs away is a prey, that´s their instinct. Why not, I have a lot of CSWs living together with a cat. But, it takes time and effort. From both sides. Cat has to have an escape route to safety at the ready at all times. To go somewhere safe, where CSW can´t follow. And both sides have to be controlled, because CSW is strong and can easily cause an injury. But cat claws can do that as well. because like before, CSW is strong and easily cause an injury. Do CSW have tendency to run out of property? sturdy enough and has to be extended even under terrain to prevent digging under. Your kennel has to be perfect. Really. find some part sticking out enabling them to unleash the destruction. I prefer simple bars from mesh wire, because mesh wire can damage their teeth. And of course, paranoia is a need. How to care about the fur? will be dry and mud will fall off. During shedding it is necessary to groom your dog regularly. Furminator works very well or metal brush for dogs. How often needs CSW to take a bath? way when I caused a little flashflood for my neighbours. Forget some good smelling shampoo, it won´t work at all. The best solution is water with vinegar. Your dog will smell after vinegar for some time but much better than eau de rotting fish or worse. Otherwise there is no need to force your dog to take a bath. What leash and collar should be used? Everybody prefers something else. I suggest using well made leather collar with metal parts or collars made of fabric. They are not damaging the fur. And leash? I use those, where it is possible to switch how long they are. At longest they are cca 180cm long. And 20cm leash hanging on the collar, useful for catching and holding the dog. There are chain collars and non-switchable leashes as well, many styles and many other materiels. Is there a CSW-proof toy? No, I do not know any such toy. If you CSW is especially keen to destroying things, they will take care of anything. I like to use tennis balls and fabric toys. Stuffed toys or animals can be nice but their lifespan counts in minutes. like them more because of their price. How much does the puppy cost? Puppies costs around 1300 EUR, exact price depends on costs the breeder has - mating fee, inoculations, pedigree, food. the prices will add and scale to very high numbers. Is breeding a profitable operation? To be honest, no breeder wants to lose money, ideal situation is to have at least something for him or her. But it is necessary to remember, costs of proper raising of the litter are there and they are not small at all. There is a lot of visitors, a lot of people are coming in their free time to spend it with the puppies, to socialise them properly. We follow the law. It states that the puppy shall not be taken away before 50th day of his or her life. In 2016 there was a case, when a breeder gave away puppies sooner and he was reported to breeders club. I heard the lies it was me who made the report. That´s not true at all. law they were very much OK.